Motor Yacht "AULICA" Outer Reef 65. PREPARATION PRIOR TO DEPARTURE - SOUTHAMPTON TO GIBRALTAR. The new yacht arrived in Southampton by container vessel from Kaohsiung, Taiwan on Saturday 5th August 2006, offloading to the dockside. On Monday after clearing security, myself, two sons Stephen and Heath, together with the able and knowledgeable assistance of Dave Alshouse from Outer Reef Yachts, we were able to commence commissioning and preparing the yacht for the trip to Gibraltar - a distance of just under 1200 nautical miles. Wednesday 9th. 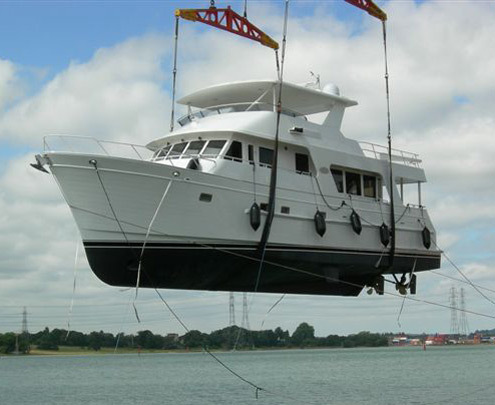 At 11am high water the yacht was lifted from the building cradle and launched into Southampton Waters. After a thorough inspection of all seavalves and watertight fittings we started engines and made our way to the fuelling jetty on the Inchin River, filling up to a capacity of just over 7,500 liters (2,000USG), then on to Shamrock Quay Marina nearby for final commissioning, sea trials with compass swings, provisioning, lifting and securing yacht tender, liferaft, engine spares, oils and a full 1600 litres of fresh water. Thursday afternoon saw the arrival of my three fellow voyagers, Neville, Jim and Vince, as Saturday morning was the target departure day. Neville and Jim had, on previous occasions crewed with me from the UK to Gibraltar on both sail and motor, and on one trip having suffered storm 11 on a new yacht with sails shredded, surprised me that they keep volunteering! Weather forecasts were showing a change of pattern from the settled conditions of previous weeks with the Atlantic High over the Azores commencing to move and a series of lows crossing West to East towards Europe. LOG EXTRACT OF M/Y AULICA - SOUTHAMPTON TOWARDS GIBRALTAR. Saturday 12th. August . 0610hrs. Slipped moorings and headed down the Inchin River and into Southampton Water towards the Solent, eventually clearing the Solent with the Needles lighthouse abeam to Starboard at 0905 setting a course of 226 T towards Ile D Oussant on the North West coast of France. Engines synchronised at 1650 revs. calculating to give 10.5 Knots fully loaded. Forecast was for winds North Westerly Force 3/5 and increasing, which meant beam seas on the port side - a good test for the Stabilizers. By mid-afternoon we were crossing the Casquettes regulated shipping traffic lanes, keeping well clear of the large tankers and container vessels. 2000 hours the wind had increased to force 6/7 bringing with it short, steep 3 to 4 meter breaking seas, typical of 100 meter deep waters. Stabilizer settings were increased to further dampen down the effects of the beam seas. Sunday 13th. August 0000 hrs with a position 18 miles north of the French coast, assisted by tide giving us up to 13 knots and expecting to round Oussant at 0400 winds had veered to NNW giving a confused port quarter sea, our concerns were of rounding Oussant in present conditions and having to alter to a more southerly course which would bring the seas more on the stern. Approaching Oussant at 0400 hrs we had lost the south setting current. 0430 hrs Altered course to due South and shortly after experiencing what must have been a 5 knot, north setting current, our speed immediately dropped to under 5 knots, The high following seas immediately swamped the stern and turned the yacht towards a broaching position and well over on starboard beam, we immediately gave full engine revs (2400) which brought us out of the broach with our speed slowly picking up to 12 knots. The increased revs had stabilized the situation although we now had to throttle back to avoid the bows burying into the seas ahead. With varying engine adjustments we were now able to maintain a reasonable southerly course, sometimes surfing at 16 to 17 knots - not intentional, but with engine control and reading the instruments we were reasonably able to control the situation. By 0700 the conditions had moderated with the seas still on the stern and wind N’ly force 5/4 we had entered the Bay of Biscay. Our Navtex weather receiver was giving South Biscay as gale force 8 with 4 meter rough seas within the next 12 hours. As we were now in a position approximately 30 hours away from the general area we decided to steer a course more easterly than previously intended and set course 208 T towards the fishing port of La Coruna 320 miles distance from our 0700hrs position, which was still within the gale area. We had used La Coruna previously in October1994 as a port of refuge, knowing it to be a sheltered port with good entrance. Monday 14th August 0000hrs. Position 45 30N 06 52W made 180 miles since entering the Bay giving a steady 10.5 knots in much easier conditions with a longer swell, a depth of 5,000 meters of water makes a difference. Wind northerly force 4. Weather reports are giving the gale as moderating to force 7 and moving in a southerly direction and south of our position. 0500 hrs with a better weather report we decided to alter course to round Cape Finnisterre off the North West coast of Spain,130 miles ahead. 1200hrs Navtex reported 13 meter yacht adrift in our area so kept a sharp lookout. 1730hrs. Cape Villano abeam to Starboard, distance 3 miles 1910hrs. Cape Finnisterre abeam, distance 6 miles. Now on course 183T towards Cape Vicente, 350 miles ahead. Tuesday 15th. August 0000 hrs. Position 42 03N 09 30W 26 miles WxN of La Guardia and the Rio Mino on the Spain Portugal border. Wind N’Wly force 6/7 seas moderate to rough and pounding our port quarter, although uncomfortable, of no real concern as by now we were by now used to the performance of the yacht. Speed 11 knots at 1600 revs assisted by a slight current which would normally be expected in this area. 1200hrs. With Portugal 25 miles on port side, and Cape Carvoeiro 30 miles ahead. Wind from the NNW has eased to force 4 with seas now moderating. Fuel change over from wing tanks to lower centre tank. 2000hrs. From our position west of Lisbon, distance to go to Gibraltar 290 miles. Calculations gave an ETA around 2300 hours Wednesday evening which would be too late for arrival at Queensway Marina. Approximate fuel calculations were taken which gave 2500 litres (670USG) still on board. Distance travelled from Needles Lighthouse to present position is 880 NM in 83 hours gives average speed 10.6 knots. Fuel consumed (approx) 4900 litres or 59 lph (15.61usgph). Maintaining same speed to Gibraltar would use approx. a further 1650 litres leaving a reserve of 13.5%. To arrive at the Marina on Thursday Morning we reduced speed to 9 knots1450 revs., allowing for further reductions on the way. Wednesday 16th. August 0000 Position 38 02N 09 20W wind NNW 3/4 sea moderate, speed 9 knots. 0650 hrs. Cape Vicente abeam 3 miles, alter course to 110T. 0800hrs. Reduced revs to 1200 giving 7.5knots ETA Gibraltar 0600hrs Thursday. 1000hrs. Changed fuel intake from centre tank back to wing tanks. Continue on course south of the Algarve and towards the Gulf of Cadiz. Thursday 17th. 0000hrs Position 36 13N 06 32W Cape Trafalgar bearing 095 16 ml. 0200 Cape Trafalgar abeam to port dist.5.4 miles. 0430 A/C to 090T 0500 Tarifa point abeam Dist .5 ml. 0530 Point Ciris, Morocco abeam to starboard 5.6 miles. Various course alterations with heavy shipping activity during the last hour avoiding early morning high speed ferries crossing between Spain, Morocco and Ceuta, together with oncoming and overtaking ships leaving and entering the Mediterranean. 0600hrs. Standing off Europa Point 0835hrs. Enter main harbour just ahead of two RN subs also coming in to berth. 0850hrs. Approaching berth stern to using aft deck controls to manouver. 0900hrs Made fast fore and aft. 0905hrs Stop engines - end of an eventful maiden voyage. 0910hrs. Crew seeking payment and a VG entry in their discharge books! IN CONCLUSION Aulica is a 20 meter Pilot House Cruiser with CE certificate Class A Ocean. Powered by twin Caterpillar C9 engines each producing 500+ Horse Power. Controlled from 3 stataions, together with the fore and aft bow thrusters. Navigation electronics include three E120 multi function screens, radar with 48” open array scanner, plus a full pack of ST 60 instruments, and Navtex for weather and navigational warnings. During the voyage the yacht proved to be an excellent sea keeper, we never felt threatened by the prevailing weather conditions. Quiet running and without any noticeable vibration or cavitation. Distance sailed Marina to Marina with deviations - 1,175 N Miles Voyage duration 5 days 3 hours - 123 Hours Fuel used, Engines and Generators - 5,900 Litres (1,556 USG) My thanks to Dave, Heath and Stephen who commissioned the yacht in super quick time, which enabled us to sail on schedule, and with everything remaining intact during the voyage. To Neville for his nav. experience and assistance in keeping the yacht on course. Jim for his uplifting spirit, culinary vision (soup-in-a-cup) and his sometime call for devine intervention. Vince for his sharp lookout during watchkeeping, and on board poet laureate. George W Hollinger.